Our Free-Standing Suet Store Displays offer a great “impulse buy” opportunity for your customers. The displays can also be customized to fit your specific store needs. Convenient and easy-to-use, these free-standing displays are a great way for your customers to find exactly what they want. 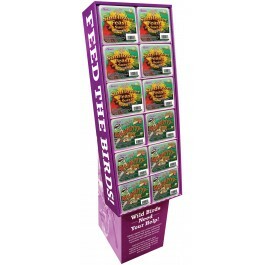 They’re shipped filled with a pre-selected assortment of suet to satisfy your customers needs. Our suet cakes, hermetically sealed for freshness and no leaks, are made with pure, fresh suet mixed with a variety of seeds, real nuts and fruits. Designed for year-round feeding, they provide needed energy and fat for hard winter months and also for nesting birds in the spring. They all fit into our easy load wire basket feeder.